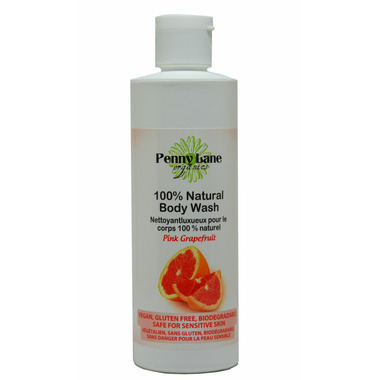 Penny Lane Organics 100% Natural Luxurious Body Wash Pink Grapefruit is a pH balanced body wash that is perfect for any skin type. Its fresh pink grapefruit scent will awaken your senses. Usage: Dispense a few drops on a wet bath glove or sponge and spread over body. Lather and rinse. Keep away from eyes. This lathers nicely and works fine but I didn't find it smelled like grapefruit at all. Smelled more like stale castile soap. Not a huge fan as a result. I agree with the reviewer below who said that it's quite runny. I find that if I'm not careful, I pour out more than I intended. But the product itself is nice, foams up and has a light smell. It doesn't leave my skin dry or tight. I loved this product for its natural feel and amazing smell! Great on sensitive skin as well. The only drawback is that it has quite a liquid consistency, so you tend to use it up more quickly.